The house is situated in Venterol a lovely conservation village and close to an excellent bistro and restaurant. Both the exterior and interior has been carefully restored to keep the original features while providing a very comfortable accomodation. A sought after feature of the house is the private South facing balcony which gets the sun all day and has magnificent views. Inside the house is on three floors :The front door leads into the spacious living room, featuring a 17th century stone sink, oak beams and wood burning stove for romantic evenings in. At the rear a new wooden floor leads to a double bedroom with fitted wardrobe and provencal brick ceiling. There is a new Italian style en-suite bathroom with walk in shower shower and WC. A wooden staircase leads to the first floor. This light and airy room has a fully fitted kitchen, Nespresso machine for morning coffee on the balcony or inside seating by the spacious dining area. The kitchen has wooden flooring, oak beams and a separate toilet. A second staircase leads to the master bedroom with its oak beams and lovely views. Full of light and overlooking the valley. The room has a wardrobe hanging frame and king size bed with split mattresses for added comfort. There is a 43"Sony HD tv with satellite tv (Freeview English language) BBC, ITV, Channel 4 ++. Blu-ray player with box sets and movies. The Village: The house is situated on the South side of a beautiful hillside conservation village with a central parking area, church,bistro and restaurant, boulangerie and art gallery. arches, tiny canal system and churchyard. Venterol hosts a thriving community, with a very active Comite des Fetes, organising the village festivals, musical evenings, hill walking, firework displays, processions and dances etc. Many hillside walks surround the village with a river close by for dipping and rambling and of course the vinyards, olive groves and lavender fields. The area: Venterol is an ideal base for both a relaxing holiday away from the crowds yet with easy access to local markets and major places of interest. 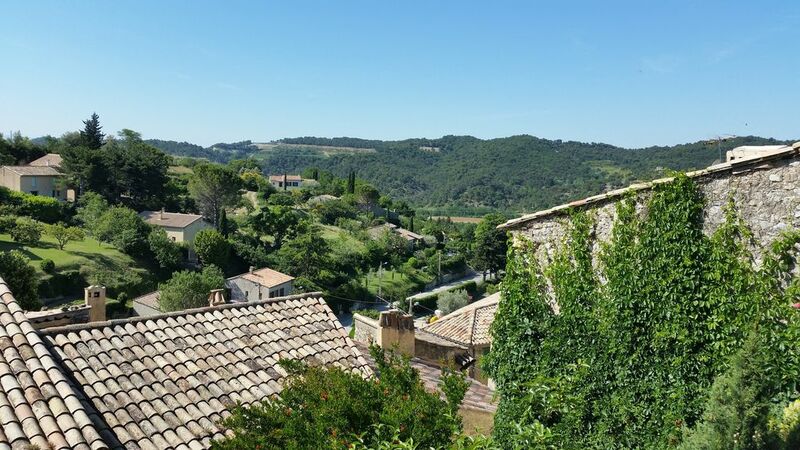 These include: The ancient city on Avignon(1 hours drive), the roman town of Vaison La Romaine( 15 min drive), the Reneissane Chateau De Grignan( 15 min drive)and of course the vineyards and lavender fields of Provence and Drome. The charming town of Nyons is close by with its mixture of shops, bars and restaurants together with a lively market each Thursday. Nearby Valreas holds a annual lavender festival the first weekend in August. Wednesday is market day with truffles stalls on show from November to February. Further afield Mount Ventoux, The Ardeche and of course the Cote De Azure are all within easy reach. Venterol is well served by the local airport of Nimes(Ryanair), Marseilles(BA, Ryanair) and Nice ( Easyjet and all major carriers). From Calais follow A26 / A31/ and A7 ( Autoroute du Soleil). Exit Montelimar Sud direction Gap/Nyons. TGV via Avignon with local connection to Montelimar Sud. A secure storage cave is available which contains wood for the Godin stove and may be used by guests to store bicycles etc. Free parking is provided in the village square adjacent to the house. Assistance with flights, car hire and ferry crossings can also be provided free of charge. Two Raleigh Activator adult mountain bikes are available to guests free of charge on request. We waren zu fünft eine Woche im August in dem sehr liebevoll eingerichteten und renovierten Haus in dem kleinen Provencedorf. Man merkt, dass die sehr netten Vermieter hier auch selbst gern ihre Zeit verbringen. Der Bäcker in dem schön verwinkelten Ort sorgt für den angenehmen Start in den Tag und die wunderbare Terrasse lässt einen die Abende bei einem lauen Lüftchen mit Blickkontakt zum Glückenturm selbst im August sehr entspannt ausklingen. Das Meer ist etwas weit, aber in Nyons und vor allem in Vaison la Romaine gibt es schöne Flussbadestellen. Wir haben viele Ausflüge gemacht und sind abends immer sehr, sehr gern wieder nach Hause gekommen. Uriges Ferienhaus in einem malerischen kleinen Dorf in der Provence. Im Erdgeschoss befindet sich das Wohnzimmer (Esstisch, Sofaecke, TV und DVD-Player) und ein Kinderzimmer (Etagenbett) und das Duschbad. Im ersten Stock ist die große Wohnküche (WaMa, Gasherd, Mikrowelle, Geschirr und alles vorhanden), ein Gäste-WC sowie die wunderschöne Terrasse mit einem tollen Blick. Im Dachgeschoss/zweiten Stock ist das (Eltern-)Schlafzimmer mit Doppelbett und Gästesofa. Das Haus ist sehr zentral im Dorf gelegen. Parkmöglichkeiten befinden sich 20m vom Haus entfernt auf dem Dorfplatz an der Kirche, deren Turm man vom Schlafzimmerfenster aus sehen kann. Im Dorf befindet sich u.a. ein kleines Bistro mit Außengastronomie zwei Häuser weiter sowie etwas weiter die Straße runter ein Café und eine Bäckerei. Einkaufsmöglichkeiten gibt es im nahen Nyons, wo man auch viele Restaurants und einen schönen Wochenmarkt findet. Ausflugsziele gibt es in der Umgebung viele, für Radtouren hätten wir während unseres Aufenthalts die Fahrräder des Vermieters ausleihen können. Der Kontakt zum Vermieter war sehr angenehm, erste Tipps zu Sehenswürdigkeiten, Einkaufsmöglichkeiten usw. inklusive. Zufällig war während unseres Aufenthaltes Mitte August Dorffest, d.h. ein großes Pétanque-Turnier in allen Straßen des Ortes, Live-Musik und leckeres Essen. A restorative with much to recommend it! Im happy to offer a reference for this house in Venterol where i have spent two happy holidays. One aspect that appeals is it's location in the middle of a beautifull Provence village which is quiet and untouristy. Its ancient and winding streets are a pleasure to explore and there is s sense of calm and tranquility which is very restorative! Also the walks in the immediate enviroment are both stunning and well signed. Inside the house is much period charm and a comfy sitting room with grat dvd's for the evening. I would thoroughly recommend this house to anyone who wants to experience France without the tourists. This area is in the heart of rural provence close to Vaison la Romaine, Orange and Aix. The routes de Vin criss cross the valley and there are guided walks in the surrounding hills and mountains.